The Red Peak Pass Loop is a 52-mile route through the heart of Yosemite. It spends equal time in the most remote and also most iconic regions of the park. Highlights include the rugged Red Peak Pass, hiking alongside the cascading “Wild and Scenic” Merced River, and a lakeside camp beneath the ice fields of the stunning Ottoway Lakes Basin. Expect challenging days, incredible scenery, and memories that will last a lifetime. 5 nights tent camping, one night at Half Dome Village within Yosemite Valley in tented cabins with shared bathrooms. We supply all group camping gear (stoves, cookware, water filters, group first aid kit, etc.). We can also supply personal camping equipment (backpacks, sleeping bags, sleeping pads, trekking poles, and tents)upon request with no additional fee. You are welcome to bring your own personal camping equipment if you prefer. A detailed gear list will be sent to you upon registration. We provide meals starting with lunch on day one through lunch and trail snacks the last day. Our "Backcountry Gourmet" meals have been acclaimed in Sunset Magazine. We take pride in providing excellent meals even in remote surroundings. Meals (as noted above), group camping gear (as noted above), personal camping equipment (as listed above), accommodations (as noted above), Trailhead shuttle on Day 1, applicable permits, professional mountain guide(s), pre-trip planning packet, and trip support from our friendly office staff. Check in to Half Dome Village within spectacular Yosemite Valley anytime after 5pm. Meet your guide and group at 6pm on the porch of the Mountain Shop in Half Dome Village for a short meet-and-greet and trip orientation. Dinner tonight is on your own at one several local restaurants. From the Clark Fork, we’ll climb gradually all day under the shadow of the imposing peaks of the Clark Range. Below Red Peak, we’ll turn toward the main ridge, eventually arriving at the spectacular Ottoway Lakes. We’ll have time to swim and clean up beneath the ice fields of the upper mountain basin. 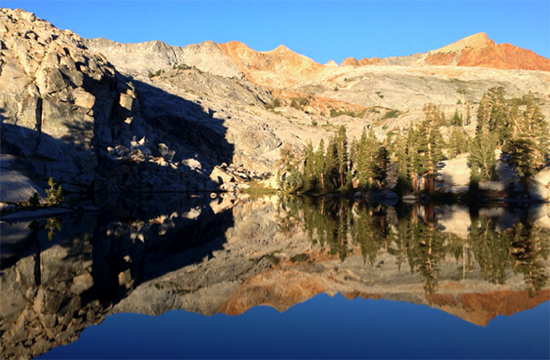 This is where, in the late 1800’s, John Muir himself discovered the first “living glacier” of the High Sierra. 9 miles. Mission accomplished and many, many thanks for making it possible. Zeki had an amazing experience with diverse weather, plenty of wildlife, and campfires with freshly caught trout. Chris and he covered more miles than the original plan and seemed to get along well. I'm sure we will be back to explore more of Yosemite. With thanks and best wishes, GB.